The unique Fenty Beauty Diamond Bomb All-Over Diamond Veil highlighter is aptly named; it is like literally putting a shimmery veil on your face. It offers a 3-D glow that flatters all skin tones. The main selling point is definitely the long-lasting formula, which is also super creamy. Texture is all that matters when it comes to highlighters. RiRi swears that she loves the jelly, powder-like, creamy formula of Diamond Bomb that melts into your skin. And it isn’t cakey at all, even when you go a little overboard. 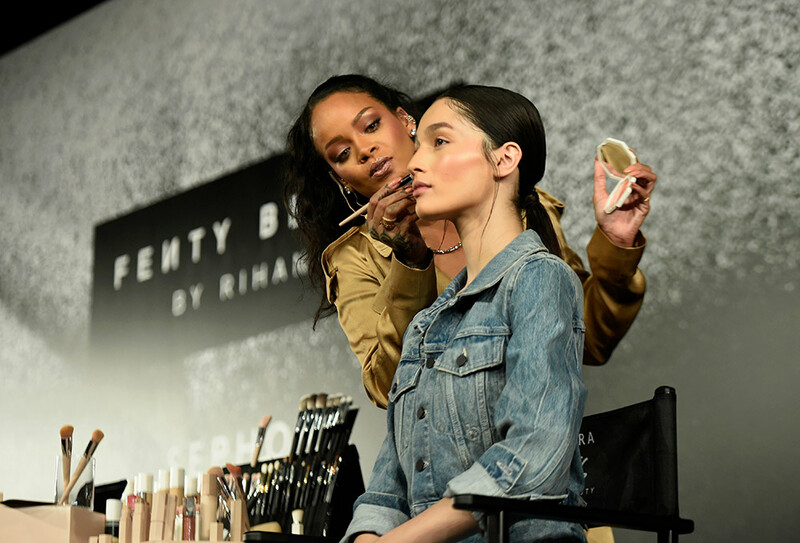 Rihanna swears by using a kabuki brush to apply her highlighter because it blends the liquid seamlessly. A kabuki brush usually has tapered bristles and is designed for focused color application. Who doesn’t love packaging as beautiful as the end result of the product itself? 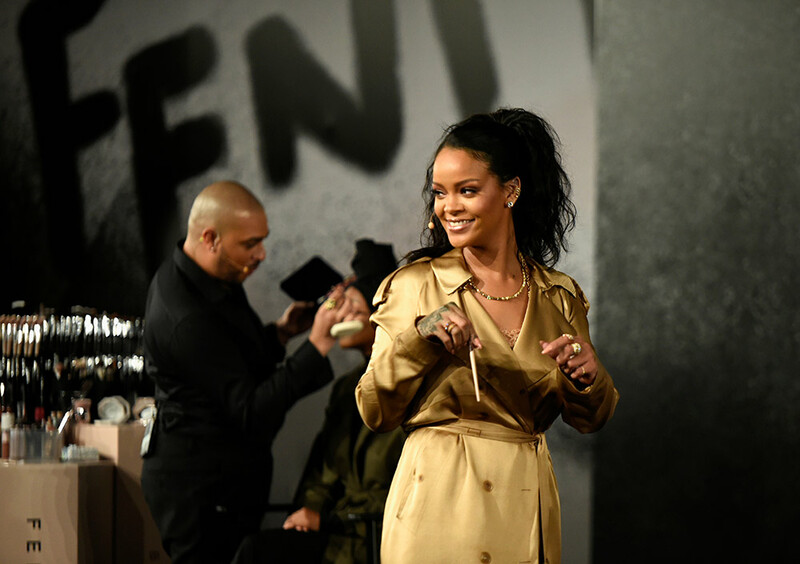 “The packaging was really inspired by my CFDA Fashion Icon look,” says Rihanna. “If you remember that outfit, then you can see the similarities between this packaging and that dress,” says the singer, whose Swarovski crystal-encrusted Adam Selman gown was probably one of her best looks ever. 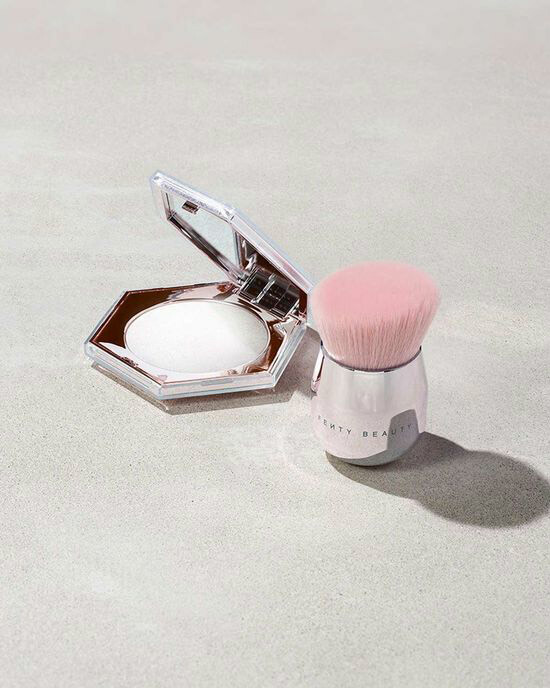 This is a highlighter that is meant to impart an in-your-face glow. In the tutorial, RiRi has a lot of fun with the highlighter, not worrying about going overboard. Takeaway: Don’t worry about the extraness, because that’s what the Diamond Bomb is all about. Rihanna showing us how to work the Fenty Beauty Diamond Bomb All-Over Diamond Veil highlighter is honestly all the empowerment we need today. The beauty mogul has been uploading fierce makeup tutorials for a while now. Her latest is about the one hack everyone needs for glowing skin: perfecting highlighter application. The beauty guru uploaded a tutorial for her highlighter and like a true goddess, gave us the scoop on the glow. In the video, RiRi reveals that the product was inspired by her 2016 “Kiss It Better” video where her shimmer game was on point. “We created this really special formula, it’s really solid, but it also feels like there’s a bit of liquid, a bit of like a smooth, creamy undertone with all the shimmer on the top,” she says in the tutorial. You Can score Fenty Beauty’s Diamond Bomb All-Over Diamond Veil on the brand’s website for $38. The post Shine Bright With Rihanna’s Epic Diamond Bomb Highlighter Tutorial appeared first on theFashionSpot. Previous Previous post: The Live From the Red Carpet PCAs Special Is Going to Be Full of Surprises: All the Details!